*takes a deep breath*...WAAAA FINALLY! OK,so...first I had to change Kanda's hair color...it was pink! >_< ...so hope that this one suits him more better -_-'. Hey, Jst asking....But is the guy w/ the Purple hair Dark Mousy from D.N.Angel....Cuz it looks like it. Othr thn tht,....It's prtty awesome! The vectoring is so clean! Wow, good job, it doesn't have any strange rounded points like the last one. Yes, changing kanda's hair colour was a must! >_< Pink.. lol, I think poodle. Kanda wouldn't have liked that. Love Allen's eyes, both of them! Especially the blue eye. Loving the tattered-ness of the webby wings! And the shading too.. Dramatic this is. Tips : Let's put a lil shine in that red eye. Make it stand out! Gradient the red - a deeper red shadow curving - and maybe a soft, white glint, like in the blue one.. Same with font - let it shine, with 'holiness'. LOL It would be striking against the balckness. Not too strong though.. In fact, just making them white would do. All ritee, that's it! Great job and hard work, especially since there are even shadows! 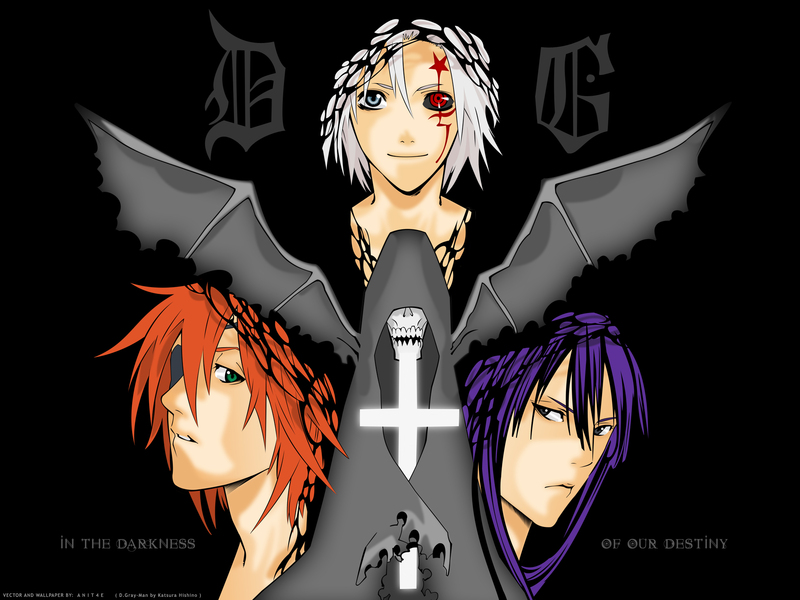 @dlSwedney-Toddlb ;its kanda from d gray man, not dark mousey ?